An entry of 550 cattle on Saturday 21st October continued to sell in a very firm demand with store cattle prices slightly firmer. 220 store heifers sold in a very good trade with prices slightly increased on the week. Forward heifers sold to a top of £225 per 100 kilos for 510k at £1,150 from an Armagh farmer. All good quality forward heifers from £195 to £224 per 100 kilos for 530k at £1,185. Aberdeen Angus heifers sold to a top of £1,375 for 650k £212 per 100 kilos for a Banbridge farmer. All good quality Aberdeen Angus heifers sold from £185 to £200 per 100 kilos. Good quality middleweight heifers sold to £266 per 100 kilos for 448k Charolais at £1,190 from an Armagh farmer followed by £259 per 100 kilos for 486k Limousin at £1,260 from a Gilford producer. Main demand from £195 to £225 per 100 kilos. Aberdeen Angus heifers to £219 for 448k at £980 for a Derrynoose farmer. Second quality heifers sold in a slightly stronger trade from £170 to £188 per 100 kilos. Armagh farmer 510k, £1,150, £225.00; Armagh farmer 530k, £1,185, £224.00; Armagh farmer 540k, £1,200, £222.00; Tandragee farmer 512k, £1,130, £221.00; Armagh farmer 584k, £1,280, £219.00; Donacloney farmer 584k, £1,270, £217.00; Armagh farmer 534k, £1,160, £217.00; Armagh farmer 610k, £1,325, £217.00; Newry farmer 556k, £1,185, £213.00; Banbridge farmer 650k, £1,375, £212.00. Armagh farmer 448k, £1,190, £266.00; Gilford farmer 486k, £1,260, £259.00; Gilford farmer 482k, £1,085, £225.00; Killylea farmer 304k, £680, £224.00; Derrynoose farmer 448k, £980, £219.00; Keady farmer 388k, £840, £217.00; Markethill farmer 386k, £830, £215.00; Armagh farmer 474k, £990, £209.00. 170 bullocks sold readily with trade slightly firmer. 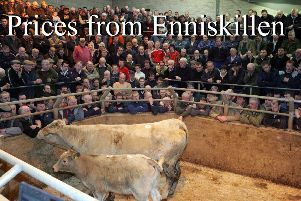 Forward bullocks to £231 for a 520k blonde at £1,200 from a Whitecross farmer followed by £223 per 100 kilos for 570k Limousin at £1,280 from a Poyntzpass producer. All good quality lots from £192 to £212 per 100 kilos. Good quality middleweights sold to £223 per 100 kilos for 368k at £820 for a Keady farmer followed by £221 per 100 kilos for 398k at £880 from a Keady farmer. Aberdeen Angus bullocks to £212 per 100 kilos for 436k at £960 from a Portadown farmer. Whitecross farmer 520k, £1,200, £231.00; Poyntzpass farmer 574k, £1,280, £223.00; Moira farmer 562k, £1,190, £212.00; Poyntzpass farmer 606k, £1,255, £207.00; Mowhan farmer 530k, £1,095, £207.00; Tandragee farmer 536k, £1,070, £200.00; Poyntzpass farmer 584k, £1,160, £199.00; Poyntzpass farmer 612k, £1,215, £199.00. Keady farmer 368k, £820, £223.00; Keady farmer 398k, £880, £221.00; Portadown farmer 436k, £960, £220.00; Portadown farmer 452k, £990, £219.00; Newry farmer 496k, £1,080, £218.00; Tandragee farmer 476k, £1,020, £214.00. 140 weanlings. Top quality males sold from £220 to £267 for 268k at £715. Suitable heifers sold from £200 to £265 for 270k at £715 from a Newry farmer. Newry farmer 368k, £715, £267.00; Markethill farmer 266k, £700, £263.00; Newry farmer 276k, £685, £248.00; Newry farmer 286k, £695, £243.00; Tandragee farmer 294k, £705, £240.00; Newry farmer 332k, £780, £235.00; Markethill farmer 322k, £740, £230.00; Markethill farmer 308k, £690, £224.00. Newry farmer 270k, £715, £265.00; Newry farmer 262k, £625, £239.00; Newry farmer 314k, £780, £248.00; Loughbrickland farmer 158k, £375, £237.00; Newry farmer 330k, £735, £223.00; Newry farmer 270k, £590 £219.00; Armagh farmer 196k, £415, £212.00; Milford farmer 354k, £750, £212.00. An increased entry in the suckler ring sold to a top of £1,450 for a Limousin cow and heifer calf followed by £1,320 for an Aberdeen Angus cow and bull calf. Several more outfits from £1,000 to £1,100 each.